Need a boost of energy? 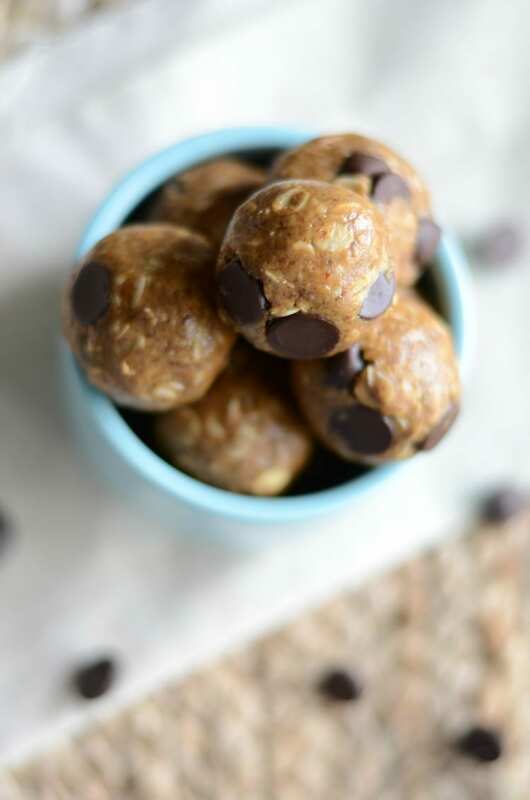 These no-bake lactation bites are what you need! Hey friend! I’m here today to tell you how these lactation bites saved my life. And yes, I am being dramatic but for good reason. (Not really. I’m just normally dramatic.) While we were waiting for Ryder to make his appearance I started doing some research on lactation cookies. With my two older kiddos I wasn’t able to breastfeed very long. Maybe a month or so with each of them. Looking back it was lack of education on my part. But I wanted to be prepared for the new baby so I looked into lactation cookies to help with milk supply. While looking through the recipes I saw a few common ingredients – brewers yeast, rolled oats and flaxseed. (These are affiliate links to the products I used.) I grabbed the rolled oats and flaxseed from my local grocery store but had to buy the brewers yeast on Amazon. While I was making a double batch of How Sweet Eats lactation cookies, I started thinking about post-delivery hunger. I knew the hospital wasn’t going to let me eat anything so I wanted to pack some snacks for after the baby was born. 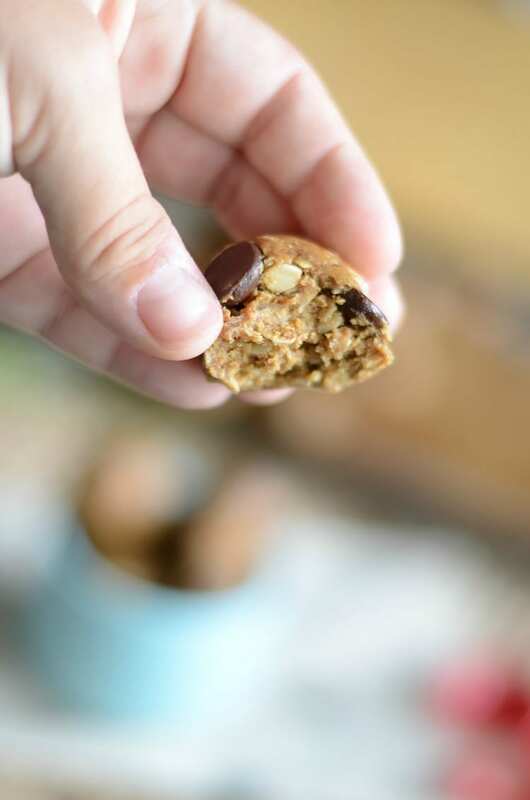 I had made energy bites before so I decided to toss in the milk making ingredients found in all the lactation cookies. I made a double batch of the energy bites and left them in the fridge for snacking. When we were heading to the hospital I grabbed a bag of the bites and tossed them in my bag. Best.. idea.. ever! After Ryder was born I was SO HUNGRY. I knew I couldn’t order food til I was moved to postpartum so I snacked on my bites. They were such a life saver to have. 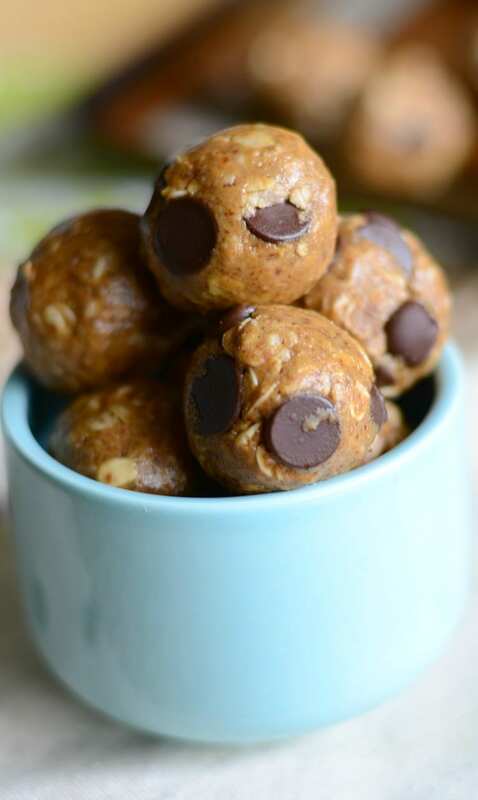 I recommend every new mom pack snacks in there hospital bag and these no-bake lactation energy bites were perfect. Also, if you are worried about the ingredients that make these bites “milky”, feel free to omit them. They are a great snack for everyone. And yes, they really do help with milk supply! I eat 2 bites a day and can tell a difference when I haven’t had one. If you are interested, I created a nursing log printable to go along with these lactation bites. I used one for all three kiddos and it helped me see how long they nursed each day. You can grab it below. Be sure to check out these easy lactation recipes as well! There are more yummy ways to help naturally increase your milk supply. In a large bowl combine the oats, brewers yeast and the flaxseed. Mix in the honey, peanut butter, vanilla and coconut oil. Press and roll into balls. Will keep for up to two weeks in a sealed container in the fridge. Use cooking spray to coat your hands before rolling into balls. Can these bites be frozen? They can! I froze a bag and let them defrost in the fridge before I ate them. Hope that help! I absolutely loved these! It has definitely made a difference for me. Just when I thought I had tried everything, I made these little delectable treats and boom, my milk came back like that! Awesome recipe ? I made these! They taste great! How many should I take a day to notice an increase in my milk? Also do you have nutritional content for them? I suggest two a day to help with supply. That is what helped with mine! Made these tonight and they are yummy! I got sick over the weekend and my supply slightly dropped. Hoping these help! Thank you for the kind comment! I bet they help with your supply. Glad you are feeling better! They did! The combination of the oats, flaxseed and brewers yeast really help with supply! I made this recipe and loved it! The second time I made them I switched out the chocolate chips for dried cranberries and it makes for a delicious surprise! Oh that sounds yummy! What a great idea Randi! So glad you liked them! 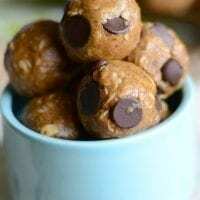 I don’t care for dark chocolate, can milk or semi-sweet chocolate chips be substituted? You sure can. Any chocolate will work! Made these today and they taste Great! Yay! SO glad you enjoyed them Emily! How many balls should this yield, and is there any benefit to using an electric mixer? You should get close to 20 balls with the recipe. I have not used an electric mixer so I can’t say if there is a benefit. It may make them more crumbly, but that’s a guess. Hope that helps! Do that need to be chilled before consuming? Nope, you can eat them right away. I would recommend storing them in the fridge though. Hope that helps! I need like a 911 help to restore my supply . Do i have to use the brewers yeast ? It certainly helps but you don’t have to use it. You can pick it up online or at places like the Vitamin Shoppe. Grocery stores don’t generally carry the brewers yeast. I found it at my local health food store. It’s cheap and it makes all the difference!? The smell of the brewers yeast I bought makes me want to gag. Do you think mixing it in this recipe will take my gag reflux away? It’s pretty tasteless. I tasted the oats and chocolate in them. I hope that helps! Best recipe I’ve found yet! 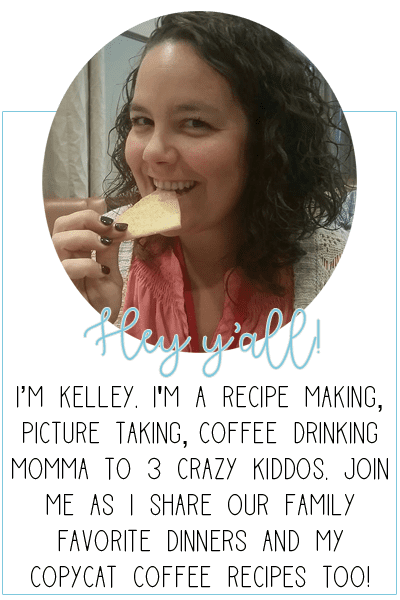 A dear friend of mine found this recipe for me and couldn’t be more thankful! How much of a boost in your supply did you see? Also, do you know if it is possible to take too many supplements to boost supply? I as because I am taking fenugreek and brewers yeast in a vitamin supplement form also. Thanks for your help! You should be fine to take these and the additional supplements – I did when I was nursing. I don’t remember how much of a boost I saw from the bites. I just remember they helped increase it a bit. Can you use nutritional yeast in place of brewers yeast? You can, but I’m not sure if nutritional yeast provides the same lactation benefits. But subbing it in should be no problem. Let me know how they turn out when you make them! Thank you SO much for the recipe! These are WONDERFUL!’I made these for my daughter today to help her with her keep up her milk supply for my new grandson and they are totally awesome! I like the dried cranberry idea someone had posted, I will totally try that in the next batch. I added about a 1/2 cup of chopped nuts to this batch as well for a little extra crunch (& the fact that nuts are good for the milk supply too is an added BONUS!). I used a cookie scoop to portion out the bites a bit better (dang OCD) and we got a good 32-33 out of them this way and still seem to be a pretty good size as well (about 3-4 bites big)! Yay!! This makes me happy! Thanks for sharing Tina! Congrats on the new grandbaby as well! You mentioned that you consume 2 a day. Is that all at one time or do you spread it out? Meaning one in the morning and one later in the day. I would eat two at once. Have you seen an increase in your milk supply as a result of these? I bought the stuff tonight to make a giant batch (some to freeze and some to eat) but I was just wondering how effective they are at boosting supply. I did see a supply increase when I ate them. I would normally eat two in the morning and they helped. Not dumb! They can eat them with all the ingredients listed. They only help lactating mothers produce more milk – they won’t do anything for kids or husbands. 😉 They are super healthy and I hope yall enjoy! Thanks for the recipe! I’m allergic to coconut oil – any suggestions on what to substitute? Is there any substitute for coconut oil? I have all the other ingredients on hand.. thanks!! I haven’t tried it substituting the coconut oil for anything so I can’t say. I’m sorry! These taste great! I added 1/2 tes almond extract just beacsuse I have it and it added good flavor. I missed the part about spraying hands before rolling the balls so it was a hot mess! I had to cool it in the refrigerator before trying again because it was so warm and crumbly for some reason. Still worked and taste great. Thanks for the recipe! I also looked up if brewers yeast had to be cooked for its benefits and it actually is better for you raw, so double score! Hope these work! Oh the almond extract sounds yummy! Hope you enjoy! What type of coconut oil? Solid or liquid? Fractioned? Liquid coconut oil. Hope that helps! I didn’t think to ask whether to use liquid of solid and only had solid on hand. I just make sure it’s combined really well like the peanut butter and honey. I normally use liquid, but you are right – solid works as long as it’s mixed really well. Thanks so much Beka! I’ve been making these balls for weeks now and love them! Do you always cook your oats first or can they be raw? I don’t cook them – I just add rolled oats. I’m so glad you love them! Will steel cut oats work too?? It’s all my store had besides quick oats. I don’t think steel cut oats would work with this recipe. The oats need to be able to bind together. You can try quick oats though – they would work better. I haven’t tried anything else as the honey helps bind everything together. Agave or chopped dates might work as a substitute. I hope that helps! Thanks so much for this recipe!!! Our newest addition just turned 3 weeks old on Sunday. I think he’s having a growth spurt. He’s now emptying both breasts rather quickly, and appears to be cluster feeding. This recipe was perfect for me. I had most of the ingredients already, it was super quick and easy which is a lifesaver because we have three other children as well. I found the brewer’s yeast at my local Wegmans, and it’s a few dollars cheaper than Amazon. I made these this morning. I also added nuts after reading it as a suggestion in the comments, they taste grea!. I had a total of 25 balls. Yay! So glad you like them! And congrats on the newest addition! They do go through a growth spurt at 3 weeks so he may be cluster feeding for a few days. Also, thank you for the info on the brewers yeast and how many you were able to make! Thanks! Made a second batch yesterday my 5yr old found them and thinks they’re cookies!!!! Haha! That’s awesome! They are pretty tasty so I can see why they like them. Can I substitute peanut butter for Nutella? I don’t really like peanut butter but I will eat it if I can’t substitute lol thanks! Hey Gabrielle! Rolled oats are any oats that have been husked. Quick oats will work! Is it ok to add an extra Tbsp of brewers yeast? Also do you know of flaxseed has the same effect on the milk supply as ground flax? Thank you! Hey there! Feel free to add extra brewers yeast to the recipe. And I can’t say for sure on the flaxseed vs ground flax. I apologize. I just updated the recipe. Approximate per bite is – sugar: 7 grams, carbs: 14 grams, protein: 4 grams and calories are 140. Good deal Ali! I wish you luck in pumping and hope you see an increase in supply! I love this recipe! I eat 2-4 bites everyday. I notice a big difference when I don’t. They are so much easier than waiting for cookies to bake and they store well in the fridge and freezer. I like to mix up thr flavor by changing up the “butter” and “chips.” I have made them with nutella, hazelnut spread, almond butter, sunflower seed butter, peanut butter, & cashew. I have also substituted canola oil and olive oil when i was out of coconut oil. They are quick and easy to make and have quickly become a must have for me. That’s awesome Crystal! I love all the different varieties you’ve made! I think I need to try the almond butter version. Mmmm! Thanks for sharing! Are you supposed to cook the oats first? No. They go in uncooked. I was so impressed by this recipe. I made some changes to it to make it easier for me. I left out the coconut oil. Added all the ingredients into a blender with a little bit of milk. I blended it to a thick, but smooth consistency. I put some of it i a bowl and microwaved it to warm it up. Then used it as a spread on crackers, toast, and biscuits to change it up. It was delicious! Thank you so much for sharing this recipe! I’m so glad you enjoyed it Crystal! What a great way to use the recipe – I love it! I love this recipe! I’m always super hungry during my early morning pumping sessions and these are handy to have made in advance. I added some chia seeds that I had on hand. I ran out and didn’t have any for two days. I definitely noticed a difference in supply. Thanks Alisabeth! SO glad you enjoy the bites! They are super handy for sure! The chia seeds is a good idea! How much chia seeds did you add? I don’t recall but I would start with a teaspoon or two and add more as needed. I hope that helps! These are so delicious! I’ve even served them as a snack when non-nursing friends come over and they love them. All the ingredients are so healthy and it still satisfies this nursing mama’s sweet tooth 🙂 the ingredients have become must-haves…and when I’m running low I go ahead and make another batch (or a double). Hehe. Thanks so much for sharing! Yes! Everything is so good for you in them! I am so happy that you like them. And they really are great for non-nursing friends as well. I pack them in the kids lunches too. I have everything but flax seeds. Can I substitute something else? The flax seed acts as binder so maybe a little more oats or a touch of flour will help. I wouldn’t add the whole 1/2 cup of flour but a little at a time until it binds together. I hope that helps! Let me know how they turn out! Will freezing these decrease the nutritional value? Not that I’m aware of. I froze mine, thawed them and keep them in the fridge and they seemed to work just fine. Interesting. Let me know how they turn out! Kelley, thank you very much! I like this bread! Wonderful combination of ingredients. It look so yummy!